Here is the email I sent the commissioners after they refused to correct my assessments. As you watch the 4 minute video keep in mind my apartments rent for $450 to $600 for a two bedroom apartment. 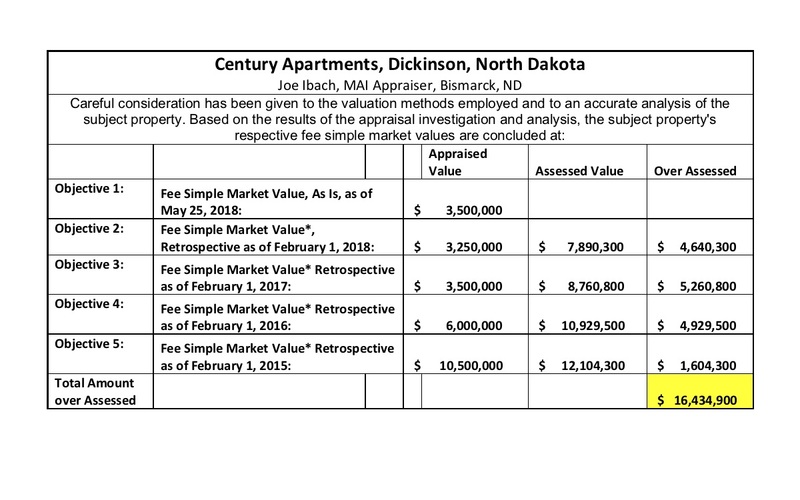 Yes, you can rent a really nice 2 bedroom apartment in Dickinson, North Dakota for $600 or less. I came to you and said my properties are over assessed. The assessor lied and said they were not. Now, that I cannot collect he admits they were as much as 60% over assessed. See Video of his statement. Over Assessments. I feel the assessor stole over $250,000 from me and my wife by over assessing my property. I believe that qualifies as grand larceny and since we are over 75 years old I believe it is also elderly financial abuse. Today the assessor says my properties are only 10% over assessed. I have attached a second independent appraisal showing Century was and still is 60% over assessed. How much proof do I need to provide for you to believe me? I have attached the complete appraisal for your review. As you can see Century is over 100% over assessed in 2017 and 2018 based on not one but two appraisals now by two different appraisers. Comment from Kelly Witherspoon after watching the video. This comment was not part of the email to the commissioners. “ARE YOU KIDDING ME!?! Who is the bald guy and does he have any common sense? Of course others want their assessed values reduced because projects are valued in INCOME that is a fraction of what it used to be. Wow, unreal. It basically makes any property unsellable due to the hit you take on NOI from tax value that they won’t correct, and now is very public knowledge. Outrageous, and sad. Kelly Witherspoon, Managing Director, BERKADIA, a Berkshire Hathaway and Jefferies Financial Group Company. Just for clarification the bald guy is the assessor. Both Joe Hirschfeld, the assessor, and Natalie Wandler, Stark County Director of Equalization, have argued at the hearings that you (the Commissioners) cannot correct Mr. Royal’s assessments or anyone else’s for that matter, not because they are right and should not be corrected but because others will want theirs corrected also. Implying all the other assessments are wrong too. I don’t know if they are or not but if the others are wrong shouldn’t you correct them also provided they show proof they are wrong like I have. If all the assessments are wrong and have been wrong as both Joe and Natalie are implying, then the assessor should be replaced for being incompetent. Isn’t it the duty of the Commissioners to catch the errors and correct the assessed values? Isn’t that the purpose of the appeal process and the spot checks (if we had them)? Right now, we as taxpayers have neither an appeal process or spot checks. Not one appeal has been approved and not one spot check has been completed. No one is checking on the assessor. I ask both the City Commissioners and the County Commissioners at their next meetings to revisit my assessed values based on the evidence I have provided and correct them. I ask the County to revisit my settlement offer. You may say it is too late, but I would like to point out that the assessor was over 30 days late getting his assessments out so there was just not enough time to get the appraisal for the hearing even though I had ordered it six weeks earlier. The appraisal is about 150 pages. Let’s make Spot Checks mandatory and let’s stop over assessments and let’s settle this. A special comment to Ken Zanders, (Vice Chairman). I believe your comment at the June hearing was, “I don’t care as long as everyone is treated the same.” It is not all right or okay that all properties are over assessed in the name of equal treatment. In fact, it is against the law. All properties are to be listed on the tax rolls at their true and full fair market value. That does not mean over assessed! We are working to get true and full fair market assessments using the courts and the legislative process with proposed changes to the law. We are calling for mandatory spot checks of assessed values by licensed independent appraisers. Please help Stop Over Assessments. Our goal is set up spot check on the assessor’s values so they cannot over assess our homes, our apartments or our commercial property at just what ever they want. Right now, as you can see mine are over assessed 100% and more compared to the appraisal. It is just not right! 100% over assessed. Wow! You don’t have to live in Dickinson to make a comment, over assessments happen everywhere and they are just not right. We can only stop it if we stand up. Most state have an appeal process that works but in Dickinson not one appeal has been approved in 3 years, not one. The assessor is always 100% right, no matter how much proof is or has been presented. I presented income and expenses, independent appraisals, and comparable sales. As you watched on the video every City Commissioner agreed my values were wrong but the County made no changes leaving them 100% over assessed. Social Media can help fix this so please post the video and tweet and retweet the link youtube.com/…nel/UCYgse9Lk0vcpK6nuOdNov6A to it. Please let all your friends know. We need to let the City and County officials know over assessing property as a way of paying their bills is not acceptable. Help me stop over assessments for everyone, who wants their home over assessed? If you want to contribute to the cause go to gofundme.com/real-estate-tax-assessment-revolt but to be honest the best way to help is send the link to all your friends and give it a thumbs up plus let the Mayor and the Chairman of the County Board of equalization know how you feel about over assessments. They are a form of theft and should not be allowed. Also, if the assessor knows they are still 10% over assessed as he stated in the video then why has he not corrected them, plus if he knew they were up to 60% over assessed in the past why did he deny it at the appeal hearings? It just doesn’t make sense unless there is corruption in the process and the system. We want to change that with mandatory independent spot checks of values. Let me quote from Don’t Squat with your Spurs On, A Cowboy’s Guide to Life, “COMIN’ AS CLOSE TO THE TRUTH as a man can come without actually gettin’ there is comin’ pretty close, but it still ain’t the truth.” page 129. We need honesty, integrity and transparency. We need true and full fair market value assessments for our homes, our apartments and our commercial property. Tenants and renters, listen up, this concerns you also because excesses taxes gets passed along to you in higher rents. P.S. No owls this year. Only bluebirds, kestrels and rabbits. Government and taxing authorities have no regard for or care about property owners. Appraisal districts increase assessment on a property and tax departments and insurance companies celebrate their increased income. Meanwhile, the property owner is thrown into the lion’s den. HO GET’EM CARLOS. That is exactly what I am trying to do but I need some help. Send a link to the email and video to newspaper and TV. I think Fox might cover it if we can show them people are interested in having their property correctly assessed no matter where you live or invest. I would get the state press involved and take it to the Governor of ND. I would get this settled by getting the assessor fired or recalled because he must be doing this to other owners. I would then get the hell out of Dodge. And I thought San Diego was known s one of the most corrupt cities in this country. Guess it’s contagious. absolutely right but I need help in getting the word out they need to here from more than just me. I would like to happen is you and other send links to the newspapers and TV station asking them to investigate. We also need facebook and social media going to work and letting be know how they feel. I spent 32 years buying and paying for properties in Dickinson, only to have the City and County take 100% of the income in taxes by using the scam of over assessments. 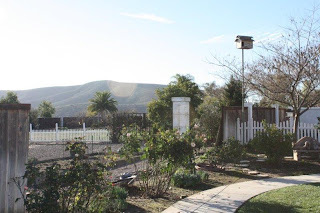 Just ridiculous as the City Commissioner said on the video but the County still would not correct my assessed values to let me at least have a few crumbs. Century Apartments for example have produced no net operating income in 2018 but the taxes are close to $100,000 dollars. If they cut the assessment what it is appraised for at least I would get some retirement money but no they want it all plus some. I sent a request to the president and asked him to call the governor since he is a republican and to ask him to look into the situation. The governor host the appeal board in August. I plan to be there. What would help is if some major news organization would pick up this story. Can the state’s Attorney General’s office help? Any state legislator from the area? With such egregious examples of bad government,and even worse ethics,it is difficult to keep one’s respect for the process. You have right on your side and I pray for a good outcome for you. I am not looking back. What I want to do is fix the system so it works correctly for everyone going forward that is why I have proposed changes in the legislation making spot checks of values mandatory. We would not have this problem if someone independent of the assessor was checking the values. Dickinson has $1.226 billion in commercial property if it is all over assessed like mine is then they have just stolen over $7.4 million dollars from property owners just for 2018 and this has been going on since 2015. This is the biggest heist in Dickinson and it is being done by the City and County. Watching the owl box was fun but this could be even more fun if you will just join in getting the word out about what is going on. It usually does not take much sunlight to make the rats scurry for cover. I want to shine some light on the issue. Hi Carlos, I sent a short email pointing out that this is an issue that Rachel Maddow would probably love to research. Hope it helps. Torri Cable My religion is kindness. Kindness is a great virtue and one that I firmly believe in. If you can’t say something nice, don’t say anything at all. From the movie Bambi. Carlos, press is all well and good, but you could be a long time trying to get their attention. Have you emailed local MSM and specific reporters? Contact info is usually on their sites. Are there spotlight teams or consumer “help me” reporters? You also mention that there are many of you? Get a gang to contact state officials! Regardless of party, sticking up for a citizen is great optics. So sorry you’re going through this. At this time of life, you should be kicking back. ;-( I sincerely hope you prevail! PS Bluebirds and kestrels? Awesome! I have contacted local press and TV and legislative body as I also work to change the law to get some accountability of the assessor’s values. I am working with Luke Simons a local legislator who plans to introduce a a bill in the next session coming up soon. Not easy but we are making progress. I did win some concession at the State Appeal so now I am fighting for some for 2017 which were turned down when I applied.